1989 - The Sir John Swinford Memorial. 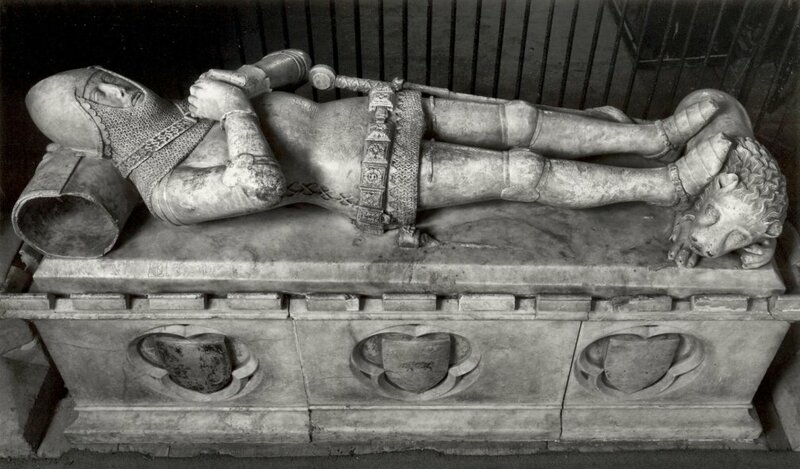 The fine detail of the carving of the figure of Sir John Swinford is clearly shown in this photograph. The pattern round the edge of his helmet, and the intricacies of the chain mail, have been carefully carved. The SS decoration round his neck denotes him as a follower of John of Gaunt, Duke of Lancaster, and is believed to be the earliest representation of this collar in sculpture. 1984 - The Sir John Swinford Memorial. 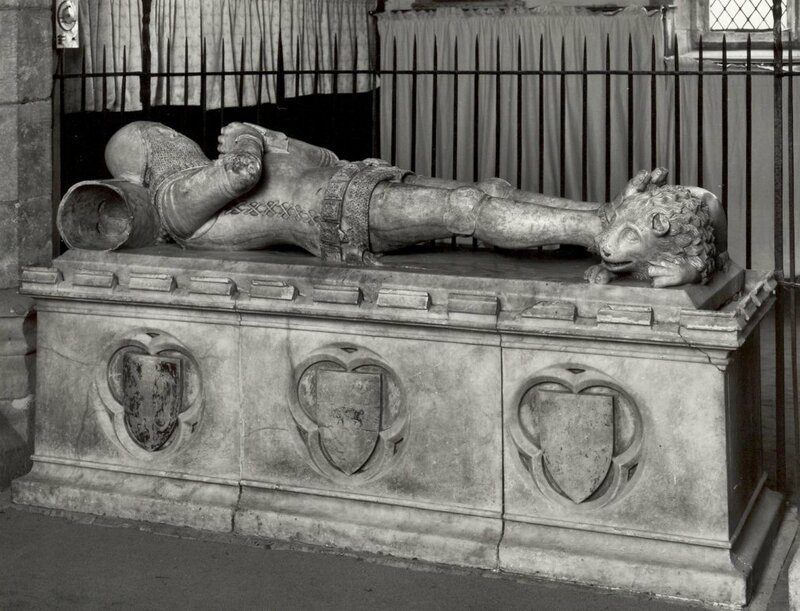 The beautifully carved alabaster tomb of Sir John Swinford (died on the Feast of St. Stephen 26th December 1371) in place of honour by the altar. Sir John had become Lord of the Manor through his marriage to the Spratton heiress Joan Arden. He fought in the wars against the French waged by Edward III and he wears the Lancastrian collar or chain of linked SS signifying that he was part of the retinue of Prince John of Gaunt, Duke of Lancaster. This is thought to be the first representation in sculpture of this special collar. 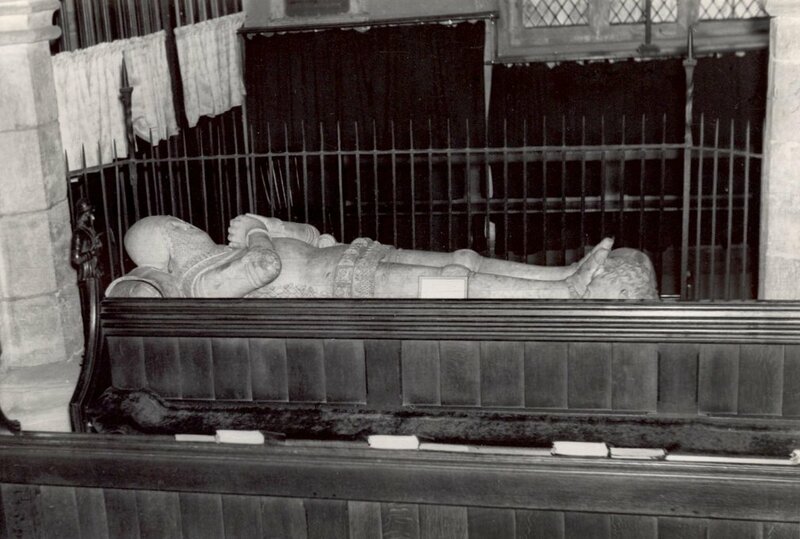 Recent research has suggested that Sir John was the brother of Sir Hugh Swynford of Kettlethorpe in Lincolnshire, the first husband of Katherine Swynford. Katherine later married John of Gaunt and they are the ancestors of most of the kings and queens of England as well as five presidents of the United States of America. 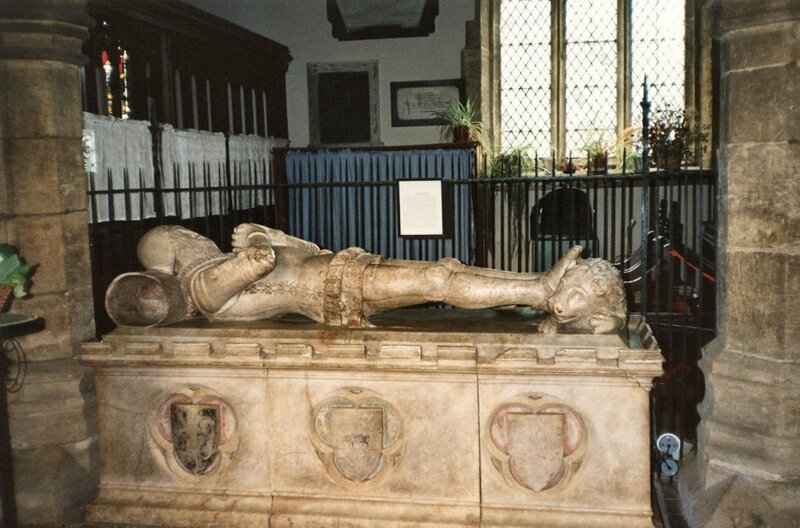 He married Joan, the daughter of Sir Thomas Arden in 1366 and, through her, inherited part of the manor of Spratton. Their daughter Elizabeth was married at the age of 13 to William de Addebury and later to Roger Chambers. Their descendants continued to hold the manor for many generations. 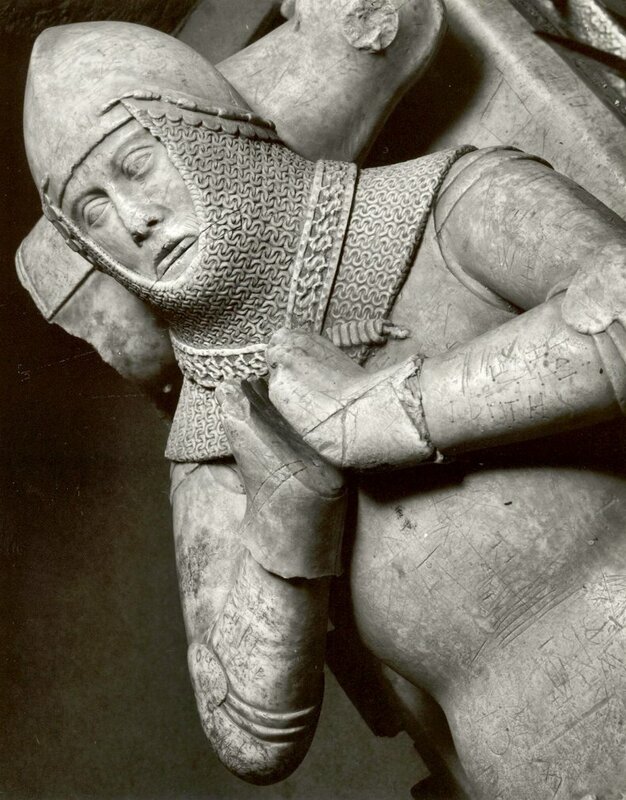 Sir John is carved in alabaster and the sculptor has finely produced the details of his armour. His helmet has a neatly scalloped edge and the tunic, or jupon, is laced at the sides. His belt is buckled at the front and decorated with foliage. His initials J S are repeated three times. From this belt is suspended a large two-edged sword. 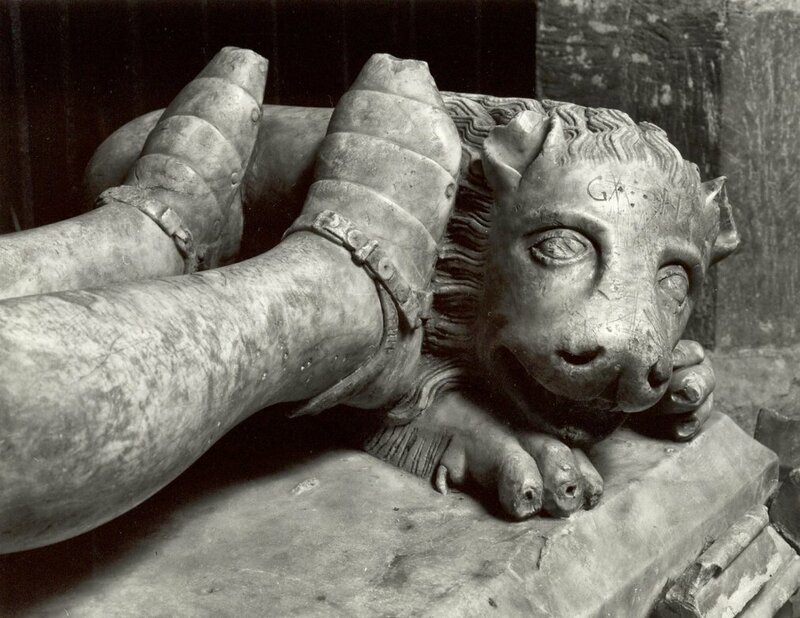 Sir John's feet, in neatly overlapping pieces of protective metal, are resting on a lion. His head is supported by a hollow titling helmet with a crest showing a boar's head. The whole tomb was originally brightly coloured and traces of paint can be seen around the coat of arms. 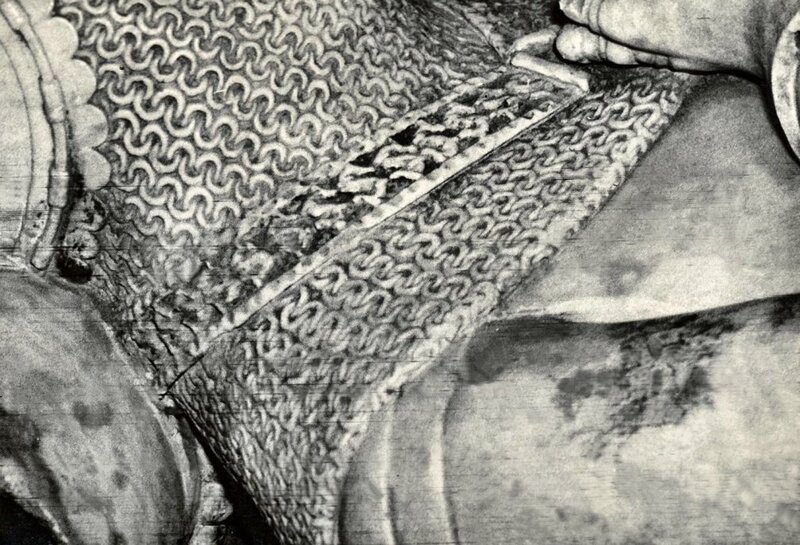 The pattern round the edge of his helmet, and the intricacies of the chain mail, have been carefully carved. 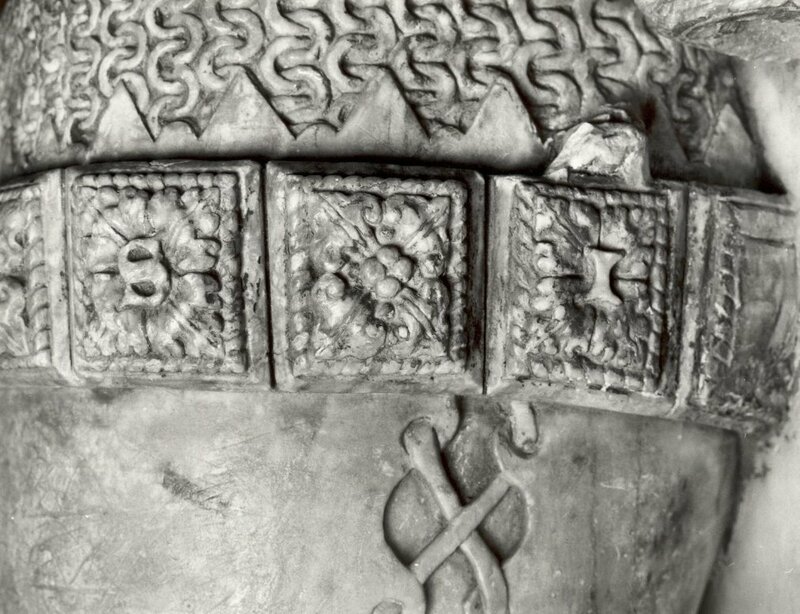 The SS decoration round his neck denotes him as a follower of John of Gaunt, Duke of Lancaster, and is believed to be the earliest representation of this collar in sculpture.